Transform Thanksgiving leftovers into a succulent Sweet Potato Soup. Just add sautéed mushrooms and a few other ingredients to your leftover mashed sweet potatoes to create a flavorful side dish to accompany turkey sandwiches. 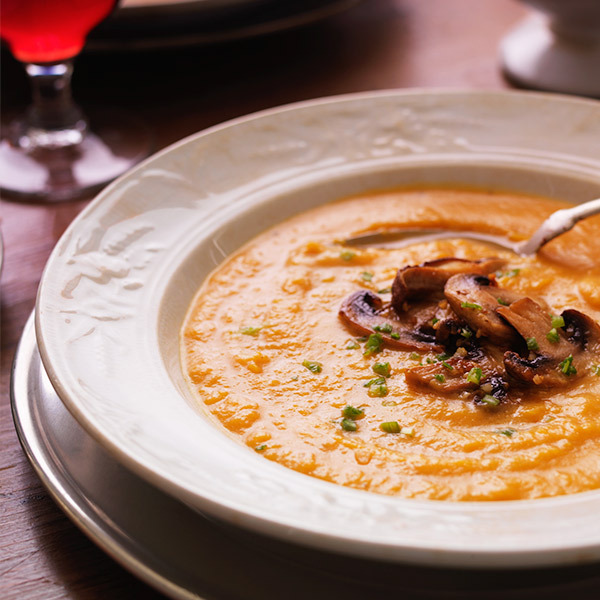 You can even add leftover roast turkey or ham to make this Sweet Potato Soup more substantial and serve it as the main attraction at your day-after-Thanksgiving gatherings. Mince the scallions, and keep the white and green portions separate. In a medium saucepan, combine the broth, scallion whites, 1 clove garlic and the curry powder. Bring to a boil, reduce to a simmer, and cook for 10 minutes. Stir in the sweet potatoes and lemon zest, and mix until well combined. Stir in the Parmesan. For a cream-style soup, puree the mixture in a blender (or use an immersion blender). Taste for seasoning, and add salt and pepper if needed. In a large skillet, heat the oil over medium-high heat. Add the remaining 3 cloves garlic and cook for 1 minute. Add the mushrooms and stir to coat. Sprinkle with a pinch of salt, and cook until the mushrooms are softened, about 6 minutes. Serve the soup in shallow bowls with some sautéed mushrooms on top. Garnish with some of the minced scallion greens.